It goes without saying that people have lots of inquisitive queries related to soundproofing paint. Is sound insulating paint capable of blocking out the noise? Since you're here I'm assuming that you've decided firmly to find a solution to unwanted noise. A lot of my clients have encountered myths from their friends & families, and they contacted me for the validation of what they had heard about soundproof paints. Are you also the one with a similar frame of mind? Without any doubt, soundproof paint is one of the easiest and budget-friendly methods to combat unwanted noise. Should we have an in-depth discussion about soundproof paint? Soundproofing paint can perform extremely well against the loud noise of your neighbors or their footsteps. Nonetheless, soundproof paint isn't an ideal way to combat high-frequency noise alone rather combining it with soundproof curtains, moving blankets, window films, bass traps etc can be a better approach to dampen unwanted sound. The best thing about these soundproof blanket is that it will combat the noise as well as decorate your room. 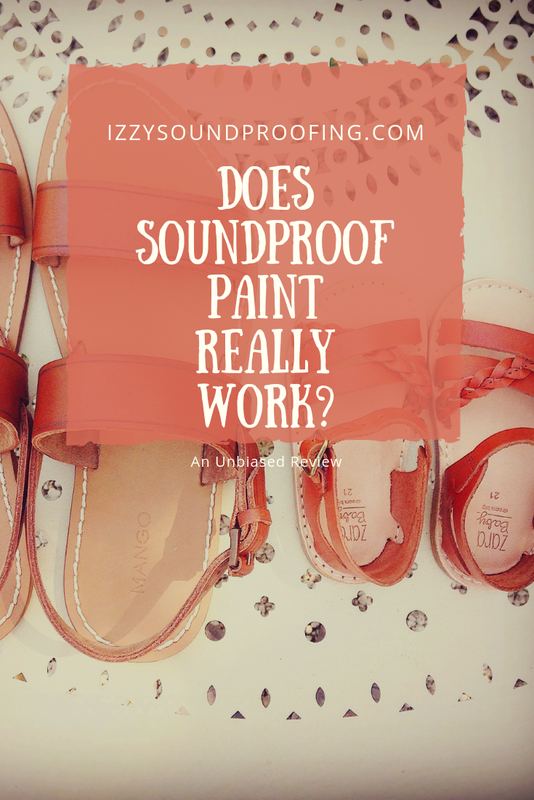 Unfortunately, soundproof paints don't come in a variety of colors. You'll need to settle down with a few available colors. Just like regular paints, these paints are also water-based. The main difference is that they are packed with latex, an environment-friendly. It is tapped from natural trees. These latexes aren't toxic, and also helps in sound insulation when added to the paint. Since it dries out fast so you can expect fast execution. If you're a newbie, then you should be aware of the fact that a single layer of soundproof paint isn't gonna do the miracle. At least, you need three layers of coating to have a tangible impact. Bonus Tips: The more the layer of soundproof paints the better will be the performance. There isn't any restriction, you can use these soundproof paints literally on any surface. The good news is that you don't need to paint the entire walls or other surfaces with the soundproof paints. Rather, you can use the soundproof paint for the most vulnerable surface, and the rest of the surfaces can be painted using the normal paint. Since these paints are chunky so you can expect the cracks of your room walls to be less visible. Soundproofing your home is NOT the only benefit that sound insulating paints possess. Never ignore the thickness of these paints. Once applied on the walls of your room, it will keep your room warm in cold weather and vice-versa. In short, you get thermal insulation free with soundproofing. As a newbie, it is REALLY important for you to understand the working procedure of soundproofing paints because it will help you to make an informed decision. These heavy-bodied paints have ceramic microspheres coupled with soundproofing fillers leading to an increase in sound absorbing ability. You can expect a tangible reduction in the bouncing of the sound waves. Since these paints are good at sound absorbing rather than sound blocking so it can dampen the echoes, reverbs, and vibrations very effectively. As mentioned earlier also, I've been working as a soundproof consultant over a decade now, and I've helped quite a good number of clients to soundproof their home as well as offices. However, the soundproofing market is flooded with paints and it wouldn't be easy for you to take a decision if you aren't well informed about the things that you need to look for in soundproofing paint. Remember, you need to apply multiple layers of acoustical paints. By doing so, it will form a thick yet soft layer on your walls. These soft layers prevent sound waves from bouncing back. As a result, echoes, vibrations, and reverbs can be controlled. Now, the question arises, "how to apply a Sound Absorbing Paint?". You can apply it on walls, ceilings, wood, metals etc. These paints can be easily cleaned, so you don't have to worry at all. Though these paints aren't available in as many colors as regular paints still you've enough colors to select from. I can assure you that you'll get the color that will suit your home decor. These paints can be applied in more than one ways. The time required in the entire process will depend on a large extent to the method that you'll select for painting your wall. For example, to speed up the process, you can consider spraying the soundproof paints on the wall. The other way to paint your wall fastly is by using rollers. Nevertheless, painting the walls using a brush can be a time-consuming affair. Out of all the three methods, the one I recommend is the rollers method. Without any doubt, there are some REALLY good rollers available on the market. However, I prefer Bates paint roller over others. It comes in packs that constitute of rollers, brushes, and paint trays. The price is quite affordable, and the performance is highly effective. When it comes to getting the best of soundproofing paints, creativity is the key to success. Try to increase the layers if you aren't satisfied with the performance. It is highly recommended to apply more paints in the corner of the walls. Once you've applied the soundproof paints on the walls, the next thing that you need to do is to use the furniture and bookshelves in a smart and efficient way. Just try to cover the walls with the bookshelves and furniture to get a mindboggling result. Again, before painting your walls, try to seal all the gaps and cracks using a soundproofing adhesive such as Green Glue. But, it will ONLY work for the mid-level frequencies. For lower & higher level frequencies, you'll need to look for other soundproofing materials. Last but not least, share with your friends and family, in case, you feel they are looking for similar kind of information.